Lou Holtz coached up the Fighting Irish and, afterward, a losing coach bemoaned a moral victory, so Saturday's college football exhibition was just like any other. Except Notre Dame won. And the game was in Japan. 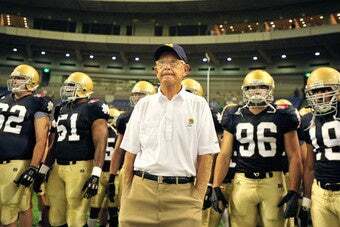 A team of Notre Dame legends trekked over to the next potential-maybe-or-maybe-not hotbed of football to play the country's national team, and — get this — the Golden Domers managed to escape from Tokyo with a 19-3 win, giving Notre Dame a 1-0 record against Japan. I'm sure it's an accomplishment worthy of the media guide, but it won't show up on Charlie Weis' page. No, because this win belongs to Holtz, who slobbered out plenty of what he thought were lauding words for the losing side. Mr. Holtz, known for his effusive praise of opposing teams, lauded the spirit of the Japan side, saying Japanese football had improved greatly and that the national squad had played at the level of a mid-major Division I-A college football program. "Getting a compliment in defeat is somewhat meaningless," said Kiyoyuki Mori, Japan's national team coach after the loss. "It's not about moral victories." Sounds like a Notre Dame kind of guy.